Home Unlabelled B-R-E-A-K-I-N-G News!!! #BokoHaramAttacks: Buhari Stopped Us From Finishing Boko Haram. - South African Military Machineries. B-R-E-A-K-I-N-G News!!! #BokoHaramAttacks: Buhari Stopped Us From Finishing Boko Haram. - South African Military Machineries. Johannesburg: Mr Eeben Barlow, the founder of Specialized Tasks, Training, Equipment and Protection,(STTEP), has revealed that President Muhammadu Buhari stopped them from carrying on fighting Boko-Haram terrorists in Nigeria in 2015. The foreign machineries helped Nigerian soldiers to crush the terror group in the last 6 months of the last administration. “The initial 3-phase campaign strategy (known as ‘Operational Anvil’) to degrade and destroy BH in Borno State, was rejected by his advisors,” Barlow added. 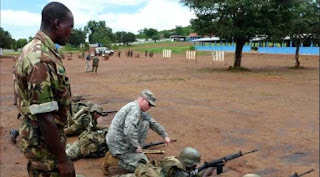 In 2014, former President Goodluck Jonathan, in his bid to put an end to the insurgency turned to STTEP, a South African private military contractor, to provide training in new weapons and tactics to the Nigerian Army. But the organization withdrew from the battle in May 2015 following the emergence of Buhari in February of the same year. The organization’s leader also said that prior to, and following their departure from Nigeria, they issued “numerous intelligence warnings” to the president but all was to no avail. “These warnings covered the implications of not allowing the 72 MSF to annihilate BH in Borno province; the plans by Boko Haram to re-arm and escalate their activities; the implications of regional spill-over, the impact on the armed forces; and so forth,” Barlow said. Barlow also opined that the recent attack by the Boko haram sect ‘negates’ Buhari’s promise of defeating the Islamist insurgents, a key promise of Buhari’s 2015 election campaign. The government continues to insist the deadly jihadists have been “technically defeated”. “His narrative that Boko Haram was ‘technically defeated’ was false as soon as he uttered those word,” Barlow affirmed in the post. Barlow’s lashing of the anti-terror war is coming days after reports in the country revealed that the sect on Sunday, November 18 overran a Nigerian Army, 157 Task Force Battalion, in Metele, Borno state. The deadly attack left at least 44 soldiers.